"I'm Tony Good and I was a rookie bass drum for the 2004 Raiders. 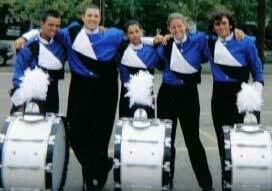 This is a picture of Raiders' 2004 bass line right after our finals performance in Denver. They are (left to right) Charlie, me (Tony), Calvin, Melanie and Scott. Being one of only two rookies here, this was a great group who taught me so much more than just playing in a great bass line. This past season was an amazing one for the corps, and just as great, or maybe better, for our bassline. "